In a climate with seasonal variations in air humidity the corresponding changes in wood object dimensions may pose a problem. I have experienced this with an organ reed pipe rank where dimensionally stable metal tubes connect to wooden plugs and pipe heads. These elements alternately become completely loose and firmly stuck, depending on humidity. This note reports an experiment to find empirical figures on such wood hygroscopic expansion, and aims to see whether it can be reduced by simple impregnation treatment. Being lucky to have a vacuum pump, a precision balance, and a micrometer at hand a test series was set up. On the flat side of each sample a diametrical shallow groove was filed in the general direction of the year rings. This direction was hard to determine for species 4 and 8, possibly in error. The round shape makes it easy to measure diameter separately along and across the year rings, corresponding to the tangential and radial directions in the growing stem. 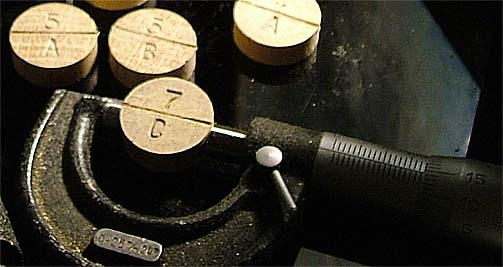 On each sample the species is identified by a digit, punched beside the marking groove. The various samples of each species are further punch marked by letters to identify the untreated reference and the three kinds of impregnation investigated. Such permanent markings are essential to avoid confusions later on. Their presence is believed not to disturb the measurements. In the measurements weight was determined with an antique Sartorius balance, resolution 0.0002 g, estimated accuracy better than 0.001 g, or about 0.1%. Diameters were taken with a screw micrometer, resolution 0.01 mm, estimated accuracy 0.02 mm, also about 0.1%. However diameter measurement errors may be somewhat larger because of local sample swelling irregularity and elasticity, in particular at high humidity. The micrometer has a 0.5 mm pitch which may at instances cause a misreading of that magnitude. To prevent such mistakes the readings were regularly also verified by doing a coarse check with a caliper. Hot hide glue. Classical style. Acqueous gel, partially filling and sealing the pores. Its water content makes the samples change dimensions at impregnation and surface smoothness is degraded. The water content of the impregnant will evaporate to leave void pore cavities after drying. Boiled linseed oil. Seaman style. The absence of water may allow for better filling of the pores. The oil hardens from oxidizing in the following days/weeks. (In contrast to raw linseed oil which does not harden). Polyethene glycol, PEG 1500. Conservator style. Water soluble (though no water was used), melting point in the 40 C range, white substance with a fatty surface, looking like wax or stearine. A candidate, conspicuously absent from the list, is epoxy or some other two component plastic compound. This was excluded at the present stage for its awkwardness in the somewhat messy impregnation procedure, and also for toxicity, short pot life, and excessive waste unless special containers are fabricated to match the impregnated objects. First all samples were dried for about 36 hours at 50 deg. C in an oven. Weights were recorded at a few instances to determine when most moist had been driven out. Then all three impregnations were done by immersion for a couple of minutes at elevated temperature, about 70 C. The impregnant and samples were kept in a glass jar in a hot water bath. In cases C and D the jar was evacuated with a vacuum pump such that air from within the wood pores initially went off as a small bubbles. As atmospheric pressure was returned the impregnant was supposedly efficiently forced into the wood. The vacuum must be subdued in case B with hide glue since this otherwise comes into violent boiling and foaming because of its water content. Within each impregnation procedure (B-D) all species (1-8) were processed together as batches to ensure they were treated alike. After some 5 min soaking the samples were carefully wiped off with tissue paper and kept for 26 h at 50 C. Then the samples were measured to determine their initial state for the humidity cycling. Also these data were compared to the sample state before impregnation. Apparently the samples were not completely dry before impregnation, most of them shrunk a fractional percent in the after heating. The hide glue samples stand out by having grown systematically. The aqueous impregnation in that case must have made them swell, and some of this was kept permanent by the glue. Also their surface became somewhat raw because of rising fibers. This roughness was not removed, e.g. by grinding, but somewhat flattened by rolling the samples against a hard surface. It was judged that the roughness as such did not significantly contribute to the dimension measurements. One observation is that the amount of hide glue impregnated is much less than for linseed oil or PEG. This must be a combined effect from that no good vacuum could be applied and its water content that will leave voids after drying. Another is that the relative amount of impregnant differs very substantially between species. The low absorption in the hardwoods oak, jarrah, and teak is no surprise, but that fir and mahogany go in the same class is. Also the large amount of impregnant going into the relatively hard birch and beech was not anticipated. Appearance of all samples after humidity cycling. Left to right species 1-8, top to bottom treatments A-D.
One purpose of impregnation is to stabilize the wood against hygroscopic swelling. It is intuitively obvious that impregnation can reduce swelling when the sample is exposed to humidity for a specified limited time. But one should also know how fast the samples adapt to a change in ambient RH. Possibly an impregnated sample may swell just as much as an untreated one, once you allow a sufficiently long time of exposure. To get a view of the material behavior the samples have been humidity cycled. The initial drying step after impregnation, mentioned above (26 hours @ 50 C), we may designate as 0 % RH. The sample weights W0, tangential and radial diameters T0 and R0, and thickness H0 recorded at this point serve as reference for the measures reported below. Thickness H was not measured further on, as hygroscopic swelling in the grain direction is known to be relatively small. Next, for humidification they were kept standing on edge on a tray in a closed plastic box at room temperature about 20 C, with a wet sponge under the tray, correspondingly called 100 % RH. After 4 days (96 hours) it appeared that essentially stationary conditions had been reached, no more significant swelling. After that the samples were left to dry partially in normal room conditions for the local early winter, 20 C and 35% RH. The samples had essentially adapted after 3 days. Finally they were oven dried for 2 days at 50 C.
At times the 32 samples were taken out in batches of 8 to determine weights W, and tangential and radial diameters T and R. This procedure took about one hour for the whole set. This is believed to be a better representation than an initially attempted one that was merely to compare relative sample weight changes. In that case the spread between species and methods comes out larger because the density of the solid material enters as an additional, but hidden scale factor. This method of measuring diameters in two square directions makes the result independent of whether the proper year ring direction was correctly identified or not. For most samples the T swelling was found to be about twice the R swelling, as is known from the literature. 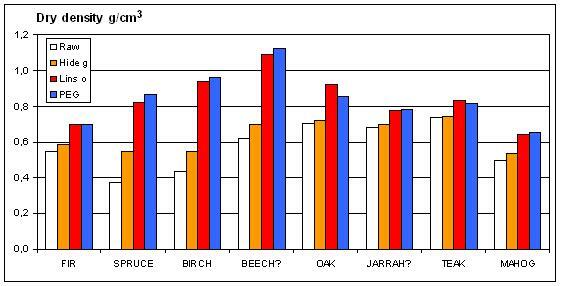 The following records render a comprehensive view of the measured data. Water contents and swelling are shown here as development over time, with measuring instances marked. It is obvious that drying is an appreciably faster process than humidification. The water absorption graphs tell that humidification had not yet reached stationary state when it was terminated at 96 h. This was not immediately obvious at that time. Humidification was halted also because the samples were becoming rather spongy and elastic. Later is was also apparent that the beech PEG impregnated sample had bled at this time. The exposure to humid air (4 days) leads toward an upper right vertex. Then follows drying in room conditions (3 days), terminating at the bold data points, followed by two final nearly coinciding points, reached after oven heating (0.5 and 2 days). Most trajectories return closely to the point of zero water content, suggesting a reasonable accuracy in the procedures. 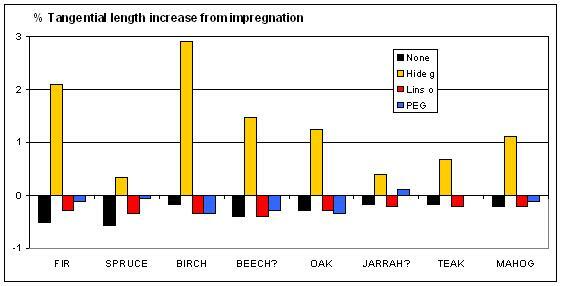 The exception is PEG impregnated Beech? which returns below zero due to a weight loss about 20 mg. Inspection of the tray for the PEG samples reveals a drop that probably has bled from this sample some time near maximum humidity. Ideally, the cycling could be a linear and reversible process. Linear in the meaning that when moist is absorbed then swelling would be in proportion, such that the trajectory becomes a straight line. Reversibility is that when the sample is dried again, then it should return to its original state. The hardwoods teak, oak and jarrah behave closely like this ideal, also fairly independent of which impregnant is used. The resinous teak stands out as particularly immune. The light and porous fir, spruce, and birch behave otherwise and reveal basic differences in function between the impregnation agents, in particular the PEG. The hide glue impregnation, as mentioned, is comparatively inefficient and somewhat destructive to the surface finish. Also in the drying process it tends to contract the material. When the samples return to dry after the cycle, then all of them have smaller dimensions than after the original drying. The linseed oil appears to invoke a more ideal behavior and to reduce absorption and swelling, even if not very substantially. At present the oil has not yet hardened. This is expected to take considerable time and motivates another test cycle later on. The PEG impregnation behaves entirely different. In humid environment it appears to be rather hygroscopic and attract excessive amounts of water to be absorbed. This apparently can cause the impregnation to bleed. On the other hand it tends to keep porous species at the 'humid' dimensions despite vigorous drying. This makes it a most serious candidate to combat the hygroscopic swelling. Possibly bleeding at excessive humidity may be a problem. Again, further tests at a later time are motivated.